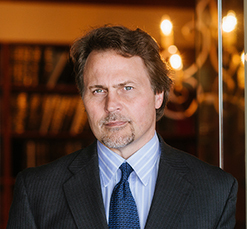 Mr. Myles has been engaged in complex commercial and business litigation for more than twenty-five years. He has defended and prosecuted partner and shareholder disputes, claims against officers and directors, professional liability claims, intellectual property disputes, franchise termination suits, claims arising out of mergers and acquisitions, Lanham Act claims, and numerous matters involving bank and real estate development disputes. Mr. Myles’ comprehensive litigation experience also includes product liability, insurance coverage, and other claims involving economic damages. He also advises businesses on matters involving the protection of intellectual property rights and other competitive advantages. He served three years as National Director of the Defense Research Institute (22,000 members) and is a member of the International Association of Defense Counsel. He was recently appointed to chair the External Policy Group of DRI’s Center for Law and Public Policy. Mr. Myles also serves as outside general counsel for several Alabama-based businesses. Regardless of the outcome of this case, I knew your firm had done an incredible job in preparing and defending our case. Moreover, it is amazing how quickly you were able to learn our business and weave in the facts you discovered to build a cohesive story. * * * More than anything, though, I’m both impressed with and appreciative of your tenacity. This may be a normal part of your practice, but it is obvious that you took this case personally in the way you defended it. * * * What you all did for us in winning this case is worth far more than money. It sends a message to all the interested parties that we did things right, that we conduct our business with integrity even when we make mistakes along the way as we certainly do. * * * Finally, I want you to know that I am very appreciative of the personal relationships we’ve built through our business dealings. You are tremendous people! I feel very fortunate to have been able to get to know you over the last few years. Preemption of Claims Against Furnishers of Credit Information, The Business Suit (Oct. 28, 2004).